GARFIELD/EAGLE COUNTIES —On Tuesday, May 19, the Colorado Department of Transportation (CDOT) will close eastbound I-70 through Glenwood Canyon for five hours to perform bridge repairs. The closure will take place from midnight to 5:00 a.m. that morning. Westbound I-70 will remain open. Traffic control, to assist with the closure, will be in place at Exit 116 in Glenwood Springs. TRAFFIC IMPACTS: Commercial vehicles should exit at 114 onto US 6 (West Glenwood) or Exit 116 (Glenwood Springs). During the closure, residents of No Name (Exit 119) will be granted local access as needed. No Name residents must provide proof of address (either with a driver’s license or utility bill) to the uniformed traffic controller. 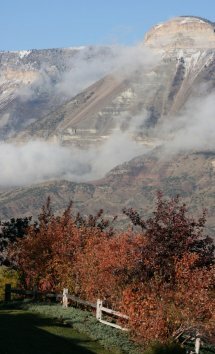 Motorists should be aware that an alternate route around Glenwood Canyon is available. That route is SH 13 north to Craig, US 40 east to Steamboat Springs and then south to SH 131 Wolcott and back to I-70. Please note that this alternate route is four hours around. The closure at Exit 116 is scheduled to last five hours, however if work is expedited the highway will be opened more quickly. For questions about the project or this closure please contact the public information team at 970-930-8009 or e:mail at I70Glenwood@publicinfoteam.com. We appreciate your patience while this important work is performed. The best way to stay up to date on project progress and impacts is to sign up for email and wireless (text) alerts. Go to CDOT’s website at www.codot.gov and click on the envelope in the talk bubble in the lower right corner of the page. Enter your information and choose the project location you are interested in receiving updates on. Information about weekly lane closures will be available at www.coloradodot.info/travel/scheduled-lane-closures.html. Division of Fire Prevention and Control, announced its selection of the Rifle-Garfield County Airport as the location for the Center of Excellence of Advanced Technology Aerial Firefighting. 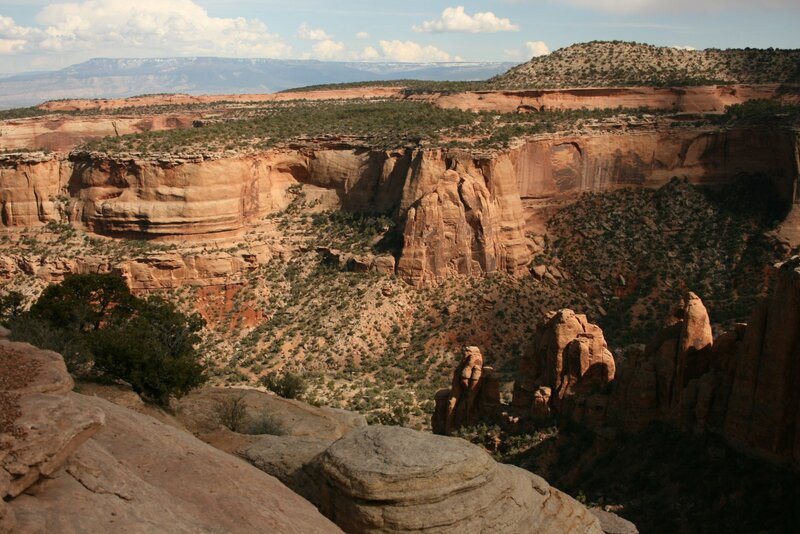 URSA will hold its Battlement Mesa Community Meeting on Tuesday, March 10, 2015 at 6:30 PM. Refreshments will be provided. The meeting will be held at the Grand Valley Fire Protection District, Station #1, 124 Stone Quarry Road, Battlement Mesa, CO.
Don't forget to Spring Forward! 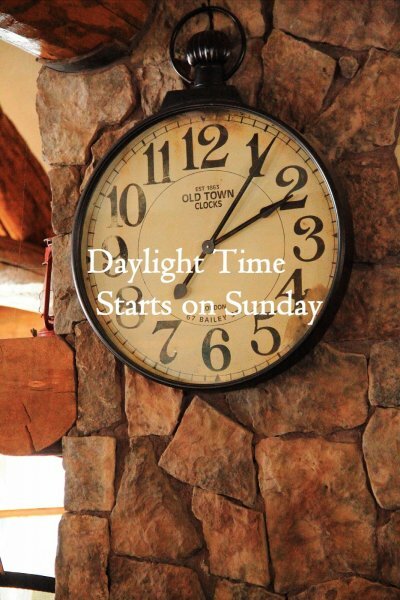 Daylight savings time starts on Sunday, March 8, 2015. The Grand River Health, Battlement Mesa - Parachute Community Health Fair is Saturday, March 7, 2015, 7:30 AM to 10:30 AM. 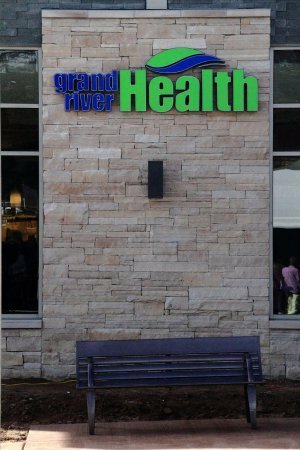 Please note the new location: Grand River Health West. Remember to fast if you plan to have blood work done! For more information call 970.625.1510. GARFIELD COUNTY/SILT – Motorists traveling on I-70 near Silt tomorrow should be aware of a controlled burn taking place. The Colorado Department of Transportation (CDOT) will have one lane closed both eastbound and westbound on I-70 as a safety precaution as the area identified for the operation is adjacent to the interstate. The burn is scheduled to begin at noon. The town of Silt is the agency conducting the burn. 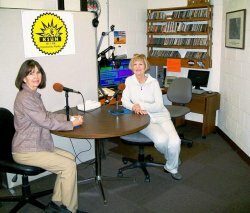 Anne Huber, board president (left), and Mary Lee Mohriang, secretary, visit in the small office of KSUN Community Radio located in the Grand Valley Recreation Center. With no local newspaper any longer, the station is an important way for area residents to obtain local information. The monthly Parachute Sun newspaper closed in late 2007 and was replaced with the monthly Grand Valley Echo in mid-October 2008, but it closed in May 2014. KSUN remains. For more than 13 years, listeners from Parachute/Battlement Mesa and beyond have been listening to this small-town, nonprofit radio station staffed only by volunteers who do it because they love their community. McDaniel does a live show at 7 a.m. Monday through Friday from the leased office space at the Grand Valley Recreation Center (formerly Battlement Mesa Activity Center). He has been a volunteer at the station since 2005. Besides music, KSUN is where listeners can hear news reports, a local weather forecast and coverage of Grand Valley High School’s basketball and football games. The station is equipped to handle emergency and Amber alerts. McDaniel said he tries his best to give listeners up-to-date news, but would love to hear more input from listeners about what’s going on. The station is on the Internet, so it can be heard anywhere. 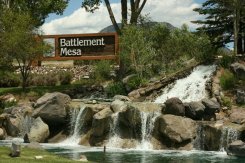 To listen on line visit, http://www.battlementmesacolorado.com/ksun-radio/ksun-fm then click on the “Listen Live” link. A group of those involved with the Sun newspaper came up with the idea in 2000 of starting a community radio station. According to Anne Huber, president of the KSUN board of directors, the idea for the station began with Jimm Seaney, when he heard that the Federal Communications Commission would be allowing an LP-FM radio license in the area. He ran the idea by Tom Beard, president of the Battlement Mesa Company at the time, who connected Seaney with Harlan Hansen, Jim Warren and Frances Rose, the publisher, business manager and editor of the Parachute Sun. The group decided to form a community radio station and enlisted the help of grant writer Terry Lynott. A board was formed and contacted various groups in the community. The station’s call letters were initially KSBP-LP-FM (Sun, Battlement, Parachute) located at 101.1 on the dial. The station went on the air for the first time at 5:09 a.m. Dec. 11, 2002, as several of the board members and a couple of the technical guys all crowded into the tiny studio. It had taken more than two years to pull it all together. The station wanted to give voice to other local nonprofits and community organizations and approached groups such as the Storytellers, a group trained at the Rifle Campus of Colorado Community College in telling stories to small children; the Shale Country Players, an amateur theater group; the Sagebrush Singers, a choral group; Grand Valley Kiwanis, a group dedicated to working with students in the local school district; members of the local birding groups; the writing club; Friends of the Parachute library; and others. Early programming included “The History of Country Music 101” by McDaniel, a run of old-time radio shows; “The Carmel & Fish Show,” which aired popular music; and “Fric and Frac,” hosted by Mary Lee Mohrlang and Lynott that evolved into Community Connections, a live Friday morning interview program. It was on Sept. 25, 2007, when a representative from Grand Junction Cumulus Radio announced that it had purchased a nearby frequency (101.3), only two digits away. KSUN, as a “junior” license holder, would have to get another frequency. Fortunately, Cumulus offered an alternate frequency and the services of Cumulus’ high-powered attorneys in Washington, D.C., to assist. However, in the early summer of 2013, the KSUN board of directors learned about an opportunity to acquire their former 101.1 FM frequency back, along with an associated license. On July 1, 2013, KSUN, through a loan from Alpine Bank, was able to acquire the KDBN license from Townsquare Media with an increased frequency from 100 to 500 watts. The station maintains its 501(c)3, nonprofit status and continues its aim to provide quality programming to the community. The station currently has about 15 volunteers and an intern from Mesa University. The current board, which has one vacancy, is made up of Anne Huber, president; McDaniel; Keith Lammey; Laurel Koning; Ann Kellerby; and Mohriang. Plans include more live programming, getting an intern from Colorado Mountain College, increasing school involvement, more volunteers and finding a commissioned advertising person. BLM is planning a 200-acre prescribed fire on the Roan Plateau today to help restore aspen stands and improve ecosystem health. 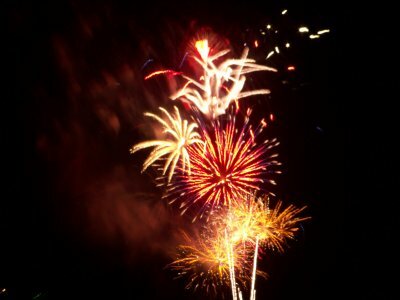 The burn will be on Short Ridge, in Grassy and Camp gulches. If conditions remain favorable, the fire will likely be ignited in the late morning and burn into the afternoon. Smoke could be visible from Rifle, Silt and the I-70 corridor.